Providing the finest health care for your pet. Tri-City Animal & Bird Clinic is a full service companion animal hospital located in Ellisville, Missouri. 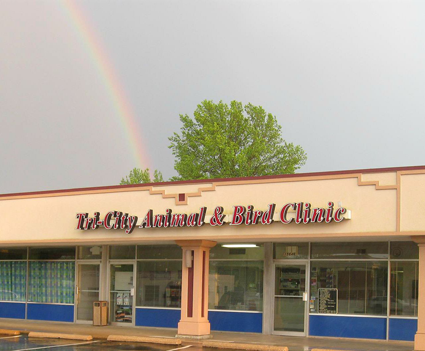 Since 1961 Tri-City Animal & Bird Clinic has provided quality veterinary care to the greater St. Louis county area including the Wildwood, Ellisville, Ballwin, Manchester and Chesterfield communities. Our services and facilities are designed to assist in routine preventive care for young, healthy pets, early detection and treatment of disease as your pet ages, and complete medical and surgical care as necessary during his or her lifetime. Our entire healthcare team is committed to providing personal attention to the unique needs of your dogs, cats, birds and exotics by offering preventive healthcare and surgery, endoscopy, avian medicine and surgery, 24-hour emergency consultation, in-house laboratory, boarding, grooming, digital radiology, ultrasonography, dentistry, hospital facilities, house calls, microchipping, pickup and delivery service and prescription diets. Tri-City's knowledgeable, caring and dedicated team is committed to providing the finest of health care for your pet. Thank you for taking the time to read about our veterinary practice and the services we offer. Please contact us at (636) 227-4041 for all your pet health care needs. We invite you to learn about our practice, our veterinary services, emergency information, useful forms, and useful pet information.